A vegan during the holiday season? You got this. When I first met my husband, he was vegan and the unfortunate victim of a household that had no idea how to cater to him and no willingness to learn. They kind of “swept by” without him, leaving him the dish of pickles and olives while they moved onto the roasted bird and dairy-laden mash. By the time I came along, a holiday he once enjoyed in his pre-vegan days had turned into a ‘eh’ family gathering like any other. He was lucky if anyone cared enough to even use non-dairy margarine in the veg at the table. He sat by and let the holiday go by. This, my friends, would not stand. It. Would. Not. Stand. That very year, I made him a full plate of everything everyone else was eating (just animal-free versions) and plastic wrapped it. I heated it up at his parents’ home, set it in front of him at the table, and he ate like the rest of us. And he was so happy. Everyone eyed his plate, asked what he was having, but continued on once the novelty wore off. This tradition will continue this year, though I’m happy to say I now host the holiday and most of the items are a compromise between omnivores and herbivores. For example, I use non-dairy margarine, nut milk and maple syrup not honey, and to be truthful, his family eats well all the same. I used to cater to vegetarians around the holidays all the time in the industry, though I was saddened by how few chefs do. I enjoyed coming up with thoughtful ways to get around the roast. It might mean making a few things from scratch or reading ingredient labels, but once you do it once, it’s easy the next time. Nowadays, there are amazing vegan turkey substitutes on the market. Our family favorite is the Tofurky® Roast, which is rolled around a meat-free stuffing. Gardein® also sells “turk’y” cutlets that are breaded and might be better than the real thing. Using vegetable stock, mushrooms and margarines makes re-orienting the meal easy, too. 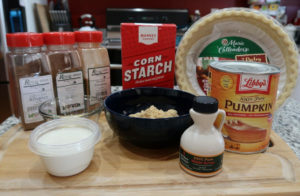 I even made a vegan pumpkin pie for him, figuring out how to sub in cornstarch for eggs. And it worked. And my Naval Officer, Wonder® Bread, meat-and-potatoes brother ate half the pie without a word. 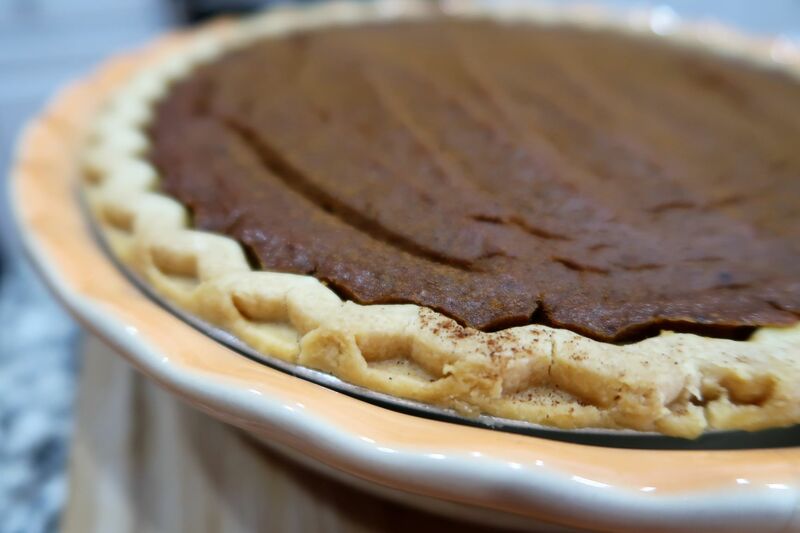 That recipe follows because hey, it’s not the holidays without pumpkin pie. And I swear, if you serve this and don’t say anything, no one will know. Even the soy and coconut whipped toppings out now are amazingly good, especially piled on this pie. Bring that along, too, and don’t be surprised if the family favors your topping over the tub next to it. And don’t buy pumpkin pie spice. Unless you run a bakery or some sort of bootleg pumpkin pie operation, you’ll never use it all. It’ll lose its potency by next November. Instead buy the components in small portions. So enjoy your holiday, and if you need recipes or tips, just ask. I’m here to help! Preheat oven to 325°F. Place your pie plate (with crust inside) on a sheet pan to catch drips/overflow. Set aside. In the bowl of a food processor, combine the pumpkin, sugar, syrup, margarine and spices. Blend until smooth. In a small bowl to the side, whisk together milk and cornstarch until smooth. 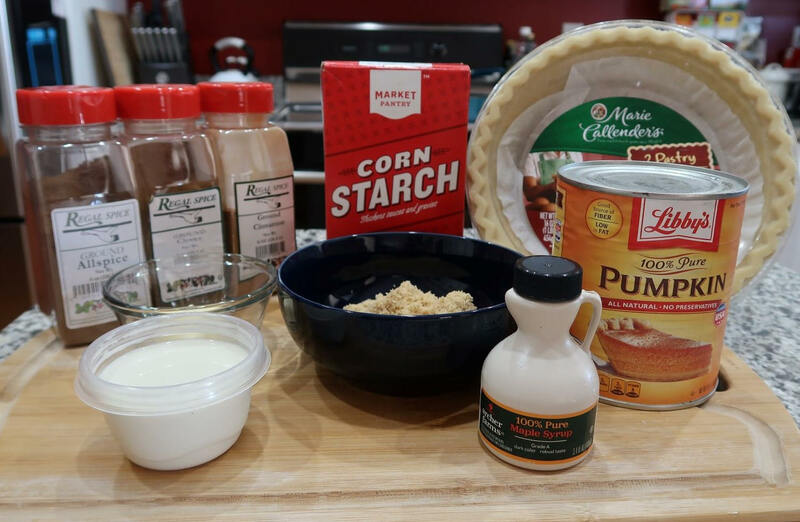 With motor running, incorporate into pumpkin mixture. Pour prepared filling into pie crust. Move sheet pan and pie plate into oven and bake 45-55 minutes. The pie crust should be lightly browned, the filling set (perhaps with a crack or two) and the top should be dried. Let cool on the counter 30 minutes before serving, or let cool completely, wrap with plastic wrap and chill until service. Calories = 111; Total Fat = 3.3g; Cholesterol = 0mg; Sodium = 28mg; Total Carb = 20.7g; Fiber = 2.7g; Sugars = 9.7g; Protein = 1.6g.